Making way for lives to be easier, SALI Production a group of young men and women presents benefit concerts for everyone to enjoy. SALi already won the hearts of many at the Himig At Tugma Para sa Buhay last April 21. Under the smoldering afternoon heat of SM Cabanatuan Garden, fans have gathered to listen to the irresistible vibe of IV of Spades. Together with local artists who performed their original songs and compositions the event successfully connected with the concert goers. As time ticks during the event and fans’ excitement fills the air, the harsh heat swiped away as IV of Spades took the stage to sing their songs. Fans, as if on a slow-motion danced and sang to the music, mesmerized by the bright colors that is Zlid, Badjao, and Blaster. The night goes on as fans scream for their idols, with some raising orange flags in support of the band. With the triumph of the Cabanatuan event, Sali Production heads for their second event bringing music and hugot lines to the city. 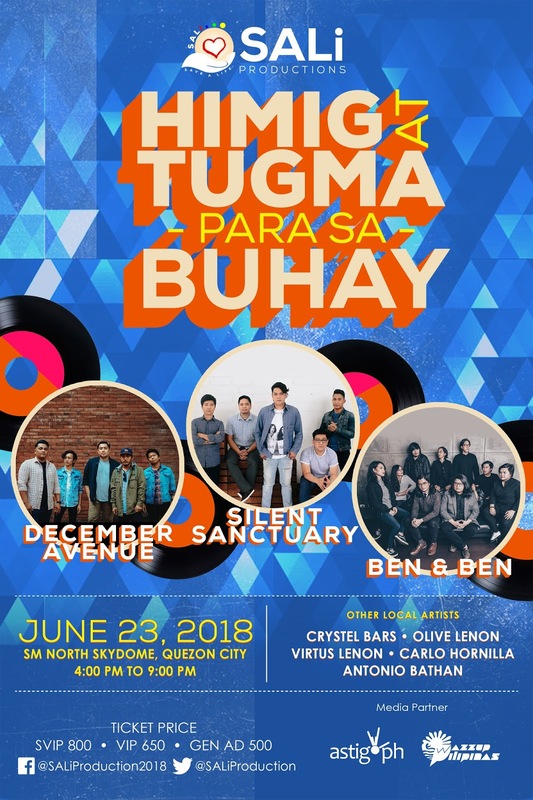 The second Himig at Tugma Para Sa Buhay will be happening at SM North Edsa Skydome bringing with them local singers and spoken poetry artists. SALi delightfully shared two band who will perform in the second event. For the concert’s Tugma, Carlo Hornilla, Crystel Bars, and Antonio Bathan will share their beloved original compositions. For the Himig, brother and sister Virtus and Olive Lenon the whose voices will surely mesmerize you will share their original songs. Completing the Himig line, Ben & Ben and Silent Sanctuary will headline the concert. Everyone who has brought the tickets has saved the lives of Briley Jane Flores for her medictations, Maryrose Bermejo for Chemo therapy, Gibram Gam for liver operation and Liza Guevarra for medicine and maintenance. SALi Production hopes for the events success as it will further help their beneficiaries into the next stage of their medications, after all SALi is an acronym that means SAVE A LIFE. Join us in our cause and enjoy our benefit concert. Be our hero and let’s save a life! For more information, visit our Facebook page Sali Porduction and our Twitter account @SALiProduction.